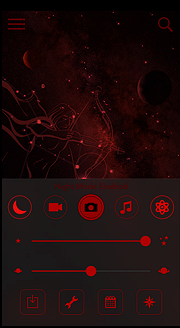 There are many free, educational and inspiring astronomy apps available for Android, Apple, and Windows 10. Many are easy and fun to use. Below are some of the better ones. Bookmark this page for future updates and additions. The NASA App page lists over 50 astronomy apps, from satellite tracking to virtual selfies in space. 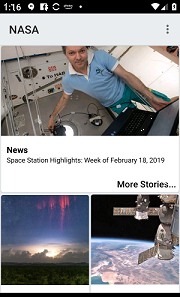 The main NASA app which you can even download for your television, listen to continuous Third Rock Radio, access an extensive "Earth as Art" image collection, read all NASA Tweets from the entire agency. You can also watch a live view of the earth from the High Definition Earth Viewer on the International Space Station, and track the current location of the ISS. You can stay informed of various countdown clocks, stay up-to-date on all of NASA's current missions, mark your favorite images of space from the NASA collection. You can even rate photos and videos and see which ones others have rated. You will be able to follow rocket launches, read up on mission information, NASA news stories, and much more. And, you can share all this with your friends on various social media platforms. Other apps are specific to astronomy interests, like 3D modeling for Deep Space Exploration, updates for the Kennedy Space Center, Space Station research. Others allow you to explore with the Mecury Orbeting Messenger, ISS Explorer, Cassini, Curiosity. The NASA apps are offered for various platforms (depending upon the app), including Android, Apple, Windows 10. 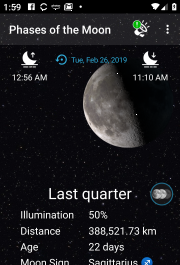 Everyone loves the moon, and with this great app, you can always keep yourself informed as to exactly what phase the moon is in. The app provides a continually updated 3-D simulation of what the moon looks like from the earth, which you can use as a live wallpaper for your phone or tablet. Using your touch screen, you can flip through past and future phases. The app also provides the user with an Atlas and Monthly Calendar. All this is provided in real time. Using your phone's ability to locate your exact position, you can use the app to plan occasions around the moon rise and moon set. The free version places a small, unobtrusive advertisement at the bottom of your screen, but the app is fun and easy to use. This particular app is for Android, but there are many phases of the moon apps available. Explore the universe with this easy to use app. This app claims to bring stargazing to everyone. This app will help identify and locate constellations day or night by using your phone's camera to pin point celestial objects that are moving overhead at your precise location. This includes galaxies, stars, constellations, planets, and even satellites and the International Space Station. The app provides red and green night vision filters. You can capture images to save and to share with your friends on your favorite social media network. The app allows you to "Time Travel" to the future and to the past, allowing you to view what the sky holds on different dates and times. Since the app does not use GPS, WiFi is not required for use. It also supports Space Navigator™ binoculars, spotting scopes, and telescopes. This app won Google Editor's Choice in 2017 and is considered to be a great teaching tool for children, students, and adults. The free version places advertisements. There are other pay versions available. This particular app is for Android and Apple. The developer of this app describes it as "Professional Telescope Astronomy Software," with the ability to accurately simulate the sky from any place on the planet. It will recreate for you how the sky appeared up to 10,000 years in the past, as well as what it will look like 10,000 years into the future. Versions of the app can be used to point your computer-controlled telescope anywhere you want. The app uses a huge database to bring you information about millions of stars and galaxies, as well as hundreds of thousands of objects within our solar system. Like other apps, you can simply point your phone and the sky chart will follow the phone's motion. 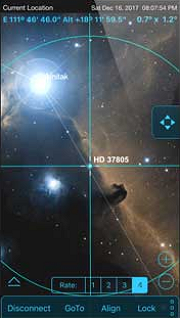 This app also gathers images and information gathered from NASA space missions and the Hubble Space Telescope. The app also features voice control, data backup, and the ability to record your own obversations. For the free version of the app, the developers say this: "SkySafari 6 shows you 120,000 stars, 222 of the best-known star clusters, nebulae, and galaxies in the sky; including all of the Solar System's major planets and moons, and more than 200 asteroids, comets, and satellites." This particular app is available for both Android and Apple.